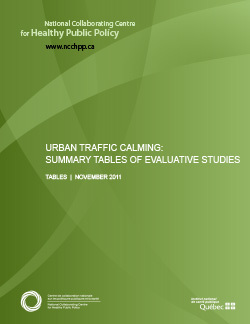 The tables below constitute a synthesis of the evaluations of traffic-calming interventions included in our literature review, including our comments.a Readers will find here a synthesis of each study (research questions, methodology, results), along with a column containing remarks about the conceptual validity, the internal validity and/or the reliability of each one. Although they are presented individually, the studies are grouped into three broad intervention categories: those evaluating individual traffic-calming measures (when these are not explicitly identified as part of an area-wide intervention); those evaluating a series of measures installed on a single road; and those evaluating a series of measures in a geographic area including more than one road (whether they were planned to function in a systemic manner on a road network or were installed without an explicitly identified intervention logic). The studies are thus presented with the aim of achieving one general goal and two specific objectives. The general goal is to allow for a reading of the studies that is independent of our working proposition. In other words, the general idea is to allow the reader to structure and interpret the information differently from the way we have done so within the context of our literature review. The first objective is to allow readers to grasp all the dimensions of a particular study that fall within one of the intervention categories. In reality, some evaluations examine several determinants of health at once (for example, air pollutant emissions and vehicle noise). However, since our literature review is organized according to determinants, the results from a given study can be distributed among different parts of the text. The format of the tables makes it possible to quickly perceive all the dimensions covered by a particular study. The second objective is to allow readers to group the studies evaluating individual interventions and those evaluating area-wide interventions differently from the way we have done in the literature review. In our review, we have used the studies evaluating individual calming measures and those evaluating a series of measures installed on a single road to analyze the effects of the black-spots approach and the studies evaluating a series of measures implemented in a geographic area comprising more than one road to analyze the effects of the area-wide approach. However, as is explained in the introduction to the literature review, there exists no consensus as to the most appropriate way to classify interventions and evaluations involving a series of measures installed on a single road. Some authors treat them as individual interventions, and others, as area-wide interventions. Thus, the tables are intended to assist readers in grouping these interventions alternatively and in drawing their own conclusions.